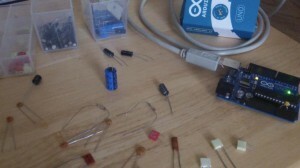 I was blown away with the interest in the Capacitance Meter for the Arduino Uno, and that encouraged me to think about how I could improve it. Scott made a comment on the Hackaday post, and suggested using the internal pullup resistor to cover higher capacitances. I had initially ruled that out because it wouldn’t work for low value capacitors (less than about 1nF). But thinking about it again, I realized that this method could be used to extend the range up to uF values. By combining this with the method in the Mk I Capacitance meter, I could make a capacitance meter that could measure from 1pF to over 1000uF – with no external components! 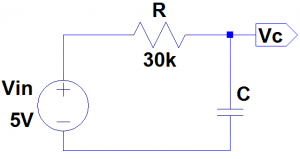 Test the capacitor using the stray capacitance method. If the capacitor is less than 1nF then we are done. Otherwise, we start charging the capacitor using the internal pullup. 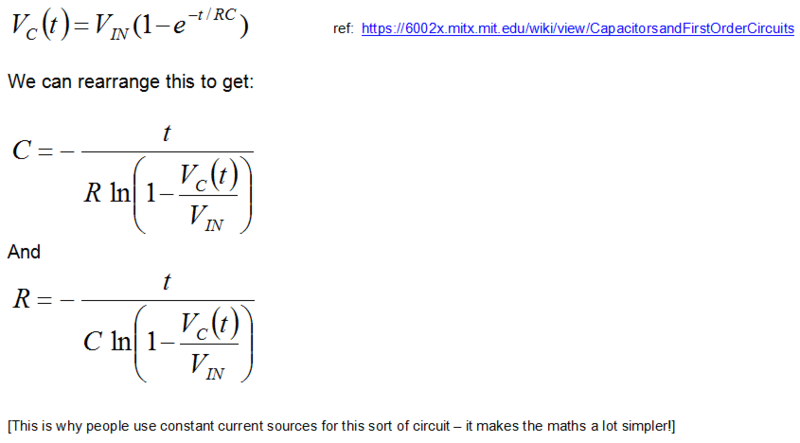 After a certain amount of time (maybe the RC time constant), the capacitor will have reached a certain voltage. 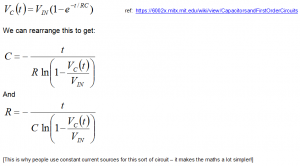 Using the charge time and voltage (or more specifically the ratio of the capacitor voltage to the charging voltage) we can work out the capacitance. Initially I assumed that the pullup resistor had a value of 30k. This won’t be correct and should be calibrated using a capacitor of a known value. Something around about 100nF – 1uF should give a good measurement (don’t use an electrolytic – these tend to have very poor tolerance, typically -20%, +80%!). By putting these numbers into the last formula, we can determine the actual pullup resistance. Putting these numbers (C = 1e-6F, t = 0.024704s, Vc=520, Vin=1023) into the last formula gives us the result: R = 34.80 kΩ (34800Ω). For C we should use the expected value (1.00uF) rather than the measured value which, as previously stated, is likely to be different until we have done the calibration. I then tested this with various capacitors. When testing electrolytics make sure that you connect the +ve end to A2 and the negative end to A0. I’m not sure how accurate this is, but I will look into this (and try to improve it if necessary) when I get a chance. Cool. You know, I ran into the same problem you did when experimenting with an Arduino based component tester design. However, for me, in order to measure small capacitances I wound up using 555s and counting its pulses. It means extra parts and it has other disadvantages. You took a much better path than me, I will experiment with this technique. Cheers. I’m interested in the tempreture sensitivity of this method. Put the Arduino in the fridge for an hour and see if you get the same measurement. My conclusion was that I couldn’t see any temperature sensitivity. I am going to try a bit colder – in the freezer (-18degC), although I’m not sure that the Arduino is rated to work at that temperature! Hey, thanks for doing that test. I’m going to build this circuit with a tiny85 in an altoids tin. Got the SPI display working this afternoon. No backlight 16×2 LCD draws < 2 ma. http://www.flickr.com/photos/wb8nbs/12194178066/ should be able to power with coin cells or AAA batterys. 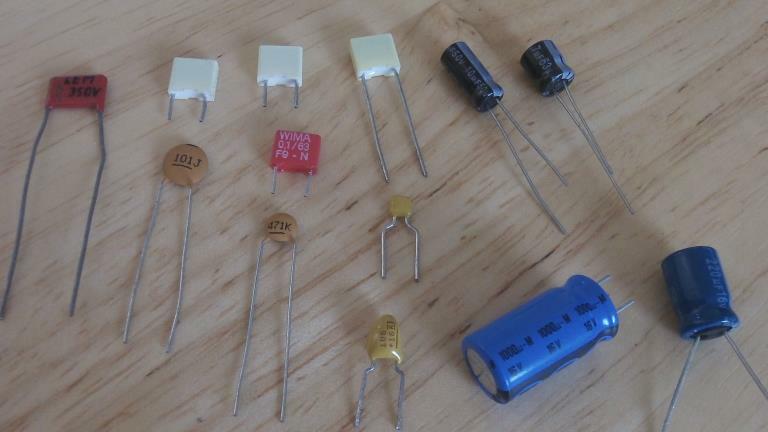 Did you success using ATtiny85? I tried 2 t85 and one t84 and they do not produce anything useful. Arduino works like a charm. I got readings all over the board and it looks like floating. Could you explain the calibration process better? I cant figure out how you get the numbers you put in to the calculation from the numbers you got out. If it spits out this: “Capacitance Value = 1.00 uF (Normal, t= 24704 us, ADC= 520)” then why do you put in this : “(1.0uF, 24532us, Vc=521, Vin=1023)” ? Also, is C in microFarads and t in microseconds, or do you have to convert them to Farads and seconds to use in the formula? The 1.0uF is the reference capacitor which should be as accurate as possible. The first time you do this it probably won’t display “1.0uF” as the measured reading. The numbers I have put into the formula don’t match the reported ones – so I’ll edit the post to make sure they do! If you use Farads and seconds you get the result in ohms. You could convert the ADC result to volts, but this is not necessary since we are dividing one by the other, so 521 / 1023 gives the same result as 2.546V / 5.0V. I’m looking forward to add a feature to measure ESR on the uF range. Any idea how this could be done? Could you explain the discharge capacitor better? I have try to measuring with a oscilloscope, but I can se the discharge. Nice article you have written ! This works for pF measurement but ,I would like to have very high resolution of the pF Meaurement ..
Do you have idea how to detect very small change in capacitance in the range of pF, that is in the range of measuring 200 to 400 pF and Resolution 0.001 ..